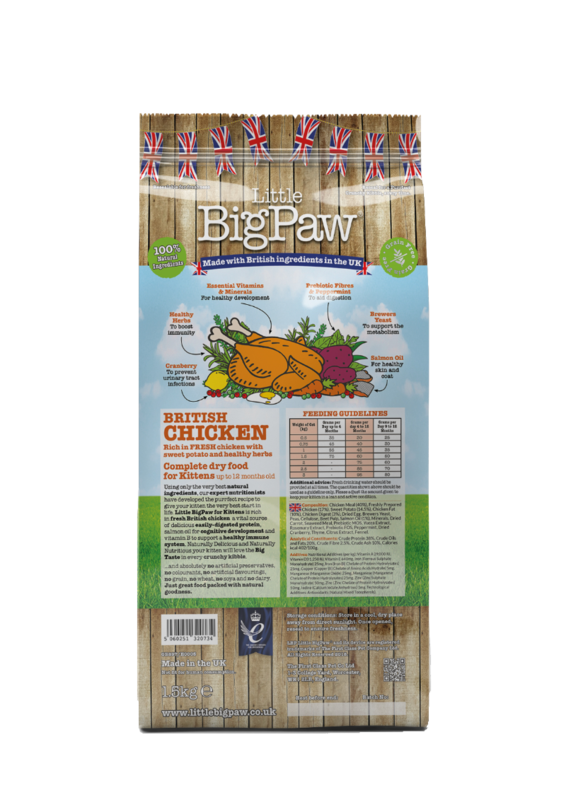 BRITISH Chicken Rich in FRESH chicken with sweet potato and healthy herbs. 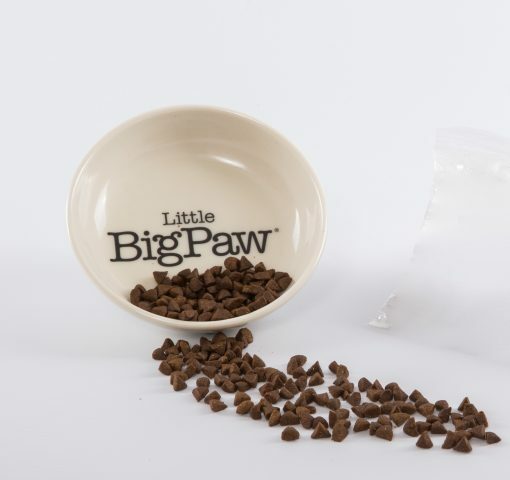 Suitable for kittens up to 12 months old. 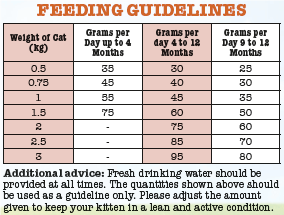 Using only the very best natural ingredients, our expert nutritionists have developed the purrfect recipe to give your kitten the very best start in life. 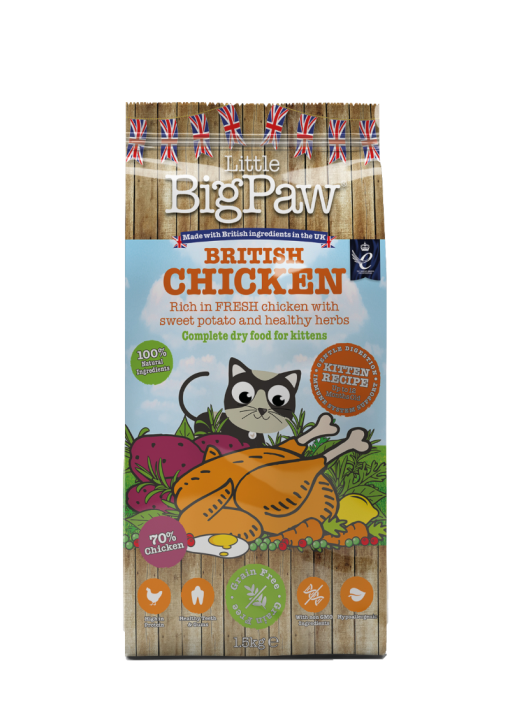 Little BigPaw for Kittens is rich in fresh British chicken a vital source of delicious easily-digested protein, salmon oil for cognitive development and vitamin B to support a healthy immune system. Naturally Delicious and Naturally Nutritious your kitten will love the Big Taste in every crunchy kibble. Composition: Chicken Meal (40%), Freshly Prepared Chicken (17%), Sweet Potato (14.5%), Chicken Fat (10%), Chicken Digest (3%), Dried Egg, Brewers Yeast, Peas, Cellulose, Beet Pulp, Salmon Oil (1%), Minerals, Dried Carrot, Seaweed Meal, Prebiotic MOS, Yucca Extract, Rosemary Extract, Prebiotic FOS, Peppermint, Dried Cranberry, Thyme, Citrus Extract, Fennel. 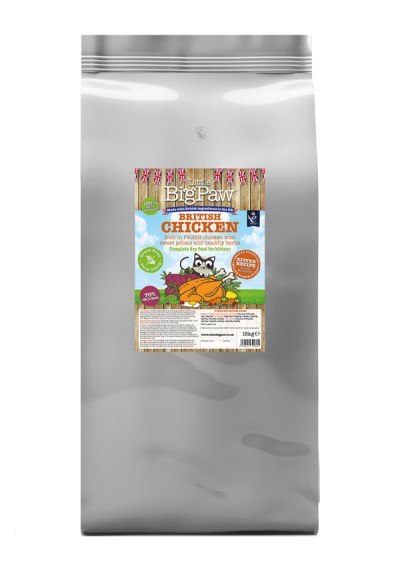 Additives: Nutritional Additives (per kg): Vitamin A 29,000 IU, Vitamin D3 1,250 IU, Vitamin E 640mg, Iron (Ferrous Sulphate Monohydrate) 25mg, Iron (Iron (II) Chelate of Protein Hydrolysates) 25mg, Copper (Copper (II) Chelate of Amino Acids Hydrate) 5mg, Manganese (Manganese Oxide) 25mg, Manganese (Manganese Chelate of Protein Hydrolysates) 25mg, Zinc (Zinc Sulphate Monohydrate) 50mg, Zinc (Zinc Chelate of Protein Hydrolysates) 50mg, Iodine (Calcium Iodate Anhydrous) 1mg. 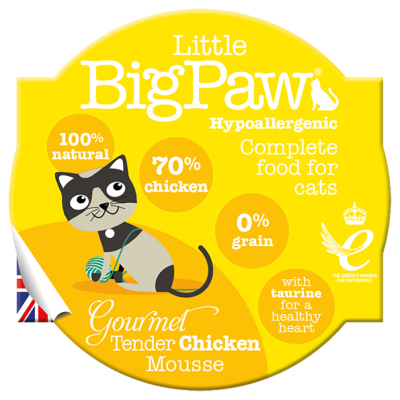 Technological Additives: Antioxidants (Natural Mixed Tocopherols).